Most people in solo businesses and partnerships have very little capital to put to work in building their business. So how do you scale you revenue and profits anyway? It’s not easy but with a creative approach, it’s very possible. 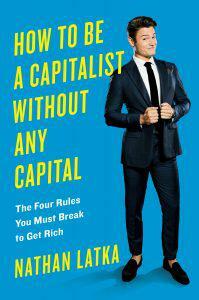 Recently, I spoke with Nathan Latka, author of the new book How to Be a Capitalist without Any Capital for ideas. Latka, 28, started a software company called Lujure, later renamed Heyo, while studying architecture at Virginia Tech, grew it to $1 million in revenue and even hired one of his professors. He ultimately sold it for an attractive valuation, which Forbes detailed . Lured by the excitement of entrepreneurship, Latka ultimately dropped out of college and today runs Latka Capital, a private equity firm, where he helps CEOs restructure their businesses and sells a database tool for other private equity firms. Currently, he is deploying $3 million in capital from a funding round he closed on, he says. Latka has acquired four companies over two years and says he brings in $100 million in income every month from his investments. He also appears on the Facebook show Latka’s Money, where he has more than one million viewers per episode. Nathan Latka started a successful software company while still in college. Now he runs a private equity firm, where he spends his time advising other entrepreneurs. Here are some ideas you can start using today. Latka’s thinking comes from his study of bridge design in college. “There is never a single point of failure,” he says. “Seven things have to snap or break before the bridge actually falls.” Having multiple projects helps to insulate you from failure, he believes. Quit worrying about being original. “If I told most people, “I’m going to launch a new company and copy someone I really respect, they’d say, ‘Nathan, that’s icky. You shouldn’t copy people. You should have your own ideas,’ “ he says. He’s not talking about stealing intellectual property. It’s more a matter of finding inspiration in what others are doing that’s successful, then putting your own stamp on it. See if your friends are willing to pay for your brainchild One of the best ways to finance a new offering, if you’re short on cash, is to offer to pre-sell it to your friends, he says. He used his email list to do a presale in his first business. “I presold to raise the first $700 I made,” he recalls. The benefit of this approach is it gives you a chance for honest market research . If they are willing to spend their money on your idea, that’s a more powerful endorsement than the usual high five.